A little know fact about me--I was once known as the Andy Roddick of the high school tennis team. Okay, I was more known as the John McEnroe of the high school tennis team. Okay, you got me again--I never played high school tennis. I did, however, play lots of Wii Sports in college, and that got me ready to review this next game on the SuperPhillip Central docket, Instant Tennis! Nintendo's Wii Sports ushered in an avalanche of similar software that went on to give the Wii an incredibly diverse demographic, from seasoned video game players to those who never had picked up a controller in their entire lives. The cultural impact of Wii Sports and much more the Wii was one that was immensely pronounced at the time. Now, we just see hints and whispers here and there of the types of games aimed at an audience that has long left Nintendo systems and gaming in general. Like Wii Sports, developer Break First's Instant Tennis is a simplistic take on the sport, offering no manual movement of players on the court whatsoever. Instead, you're limited to when you hit the ball and where you hit it to, and this all depends on the control scheme you opt for. Instant Tennis has three different control schemes to utilize, depending on the player's skill level or if you're like me (and hope to God you're not), the mood you're in. Full motion controls are as simple as flicks of the Joy-Con when the ball got close to my character. A hard, fast flick sends the tennis ball to the back of the court while a soft, slow flick results in a drop shot. Depending on when you flick the Joy-Con, the ball gets hit to a certain side of the opponent's court. 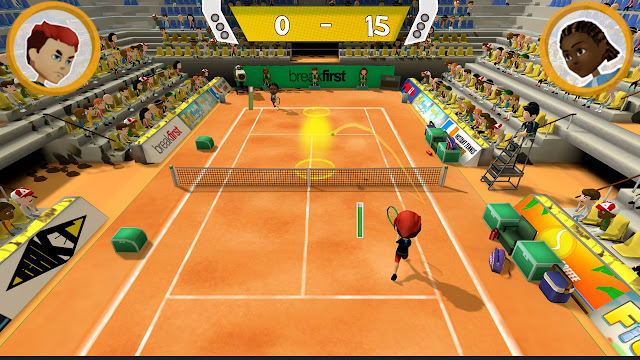 As you get ready to strike the ball, a yellow line appears on the opponent's half of the court, and it moves from right to left. If you hit the ball too early or too late, the ball will go out of bounds, giving your opponent the point. Then, there's the Mixed mode, which has both motion and analog controls. You use the analog stick to aim on the court (to the left and right, but nothing more in the way of fine-tuning than that) and then proceed to flick the Joy-Con to strike the ball. Finally, full analog control play sees you holding the shot button down. The longer you hold it in, the harder you strike the ball. Meanwhile, you aim with the analog stick. This control scheme might seem unfair to use against someone using another type, but the developers have balanced it so that when you set up your shot, the yellow line that serves as your aiming point will always move itself to the middle of the court. That means you have to carefully move the analog stick just far enough to the left or right without hitting it out of bounds to trip up your opponent. It makes for a control scheme that would otherwise make Instant Tennis too simple for even the most inept of players. What Instant Tennis misses in depth, it more than makes up for in accessibility for all ages. That said, this doesn't stop Instant Tennis from being all too simple a game. Against AI opponents, it's far too easy to cheese wins against them, serving the tennis ball with a hard shot on one side of the court and then hitting a weak drop shot on the opponent afterward once the ball gets rallied back to you. This is mostly due to an unbalanced stamina system within the game, which stamina goes down as your opponent is run ragged across the court. This is performed by hitting shots to the front, back, and sides of the court--making your opponent chase after lots of shots. With AI matches, it's as breezy as having their stamina deplete to nothing and easily taking advantage of that. In player vs. player scenarios, it's merely a matter of who lucks out with their endurance. 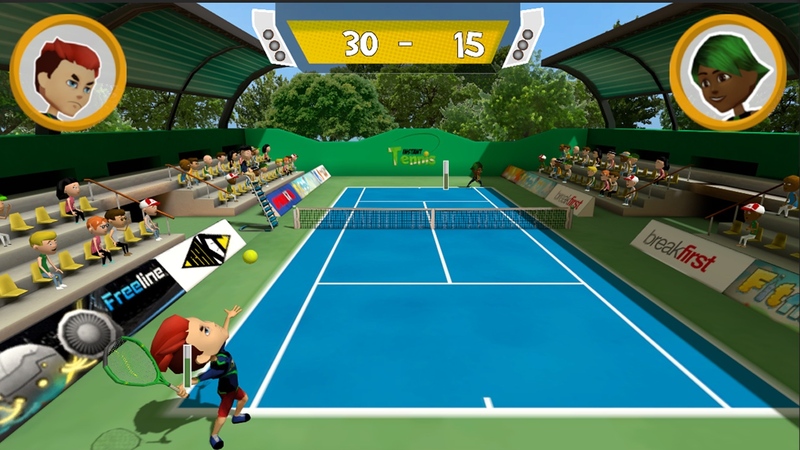 Instant Tennis provides a fair amount of content with a leveling system that gives your profile experience points for completed matches and tournaments won. As you gain more levels, new content unlocks in the form of new characters and courts (nearly 20 characters total in the roster--albeit heavily generic with no personality whatsoever--and nine courts). Whether the somewhat basic and repetitive gameplay of Instant Tennis will make you want to go the distance to level up and unlock everything is up to you. Unfortunately, the gameplay did not do much to entice me to continue playing for too terribly long. and a drop shot (the front circle) will bounce. Though, true to its name, Instant Tennis does offer quick and accessible bite-sized tennis matches that anyone can enjoy. 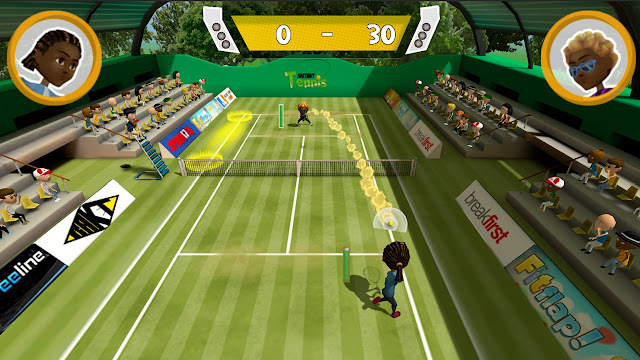 For those who are less skilled with gaming or are just starting with the pastime, then this Switch tennis game is a terrific one to try out. For everyone else, Mario Tennis Aces--though more expensive by a significant amount--is a more pleasurable time on the court. Then again, that's like having me compete with Rafael Nadal in a tennis match. Not really a fair competition... for Nadal, of course.